In many parts of Africa, there is a tradition of holding elaborate and expensive funerals, the costs of which are typically prohibitive for the vast majority. People are often forced to rely on informal burial societies for providing funeral coverage services. As such, the demand for affordable life/funeral insurance is immense, but given the unattractive economics under the traditional insurance models, the market remains largely undersupplied. Despite the high potential demand, traditional insurance companies have been unable to break even within the low-income customer segment, given poor people's inability to afford the minimum insurance premiums required to make the model viable. Hollard reported $1.6 billion revenues in 2010. The contribution of its funeral insurance policies was small, but the initiative addressed an unmet customer need and boosted the brand. In 2006, Hollard Group, South Africa's largest privately held insurance company, decided to test a new business model to tap the large potential market. By partnering with PEP, a popular clothing retail store, Hollard separated the sales and distribution elements from the costly insurance processing and advisory elements. PEP, a high-volume, low-margin clothing chain with more than 1,100 outlets across South Africa, was the perfect counterpart for the new model. It already had a captive customer base and had mastered the art of profitably running a low-margin, optimised distribution model. While PEP helped make distribution more viable, Hollard brought in the expertise to effectively price and manage the associated underwriting risks. This is a classic case of collaboration between players from different industries seeking to tap bottom of the pyramid, or BOP, customers and underlines the need for innovation not only in product design but also in lowering distribution costs. Providing insurance protection to the BOP population is a challenge due to high operational costs, and cannot be viable without innovating on the business model. Here, Hollard with its expertise in underwriting and product design lowered its distribution costs by tying up with PEP. This was also a symbiotic relationship where PEP got additional revenue from the same set of customers. The case is relevant to India where access to financial products and services like banking, mutual funds and insurance is still limited. Take the low penetration of general insurance. Penetration - measured as a percentage of total premiums to GDP - has been stagnant at around 0.6 per cent for the last several years. The social cost of this low penetration is striking. A recent McKinsey study estimates that only around 14 per cent of India's population is covered by health insurance in any form, of which only 15 to 20 per cent is covered through health insurance provided by insurance players. Studies further estimate that about 40 per cent seeking hospitalisation do so by selling some asset or taking loans. Yet abundant caution is essential before distributors rush into such collaborative cross-selling distributors like PEP. They must ensure the new product adds value to customers. Similarly, a manufacturer of financial services seeking to distribute its products through an affinity base distribution model will need to ensure that the products are simple and cheap. Great care should be taken to minimise the risks of mis-selling. Innovations are required in product range to make the policy issuing process and servicing quick, efficient and low cost. Defined benefit products would be more successful. An example is how Bajaj Allianz General Insurance has used the distribution network of NGOs to provide micro-insurance to the tsunami-affected in Tamil Nadu. 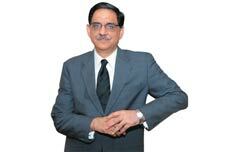 Policy makers are aware of the low level of penetration of financial services. They also know that given an innovative model, servicing BOP customers can be financially rewarding. On the banking side, the introduction of no frills accounts with diluted 'know your customer' norms and the increasing acceptance of business correspondents is a pointer. Today, credit bureaus largely collect information on loans from banks and financial institutions. Policy makers need to examine information from mobile phone companies as well. Utility providers and insurers should also be collated. This information will be relevant for financial underwriting, especially when financial inclusion has to go beyond a saving bank account and must also include access to insurance and loans. 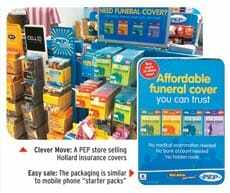 The insurance products, targeted at families with monthly incomes from $350 to 600, are PEP-branded and are sold in packaging similar to mobile phone "starter packs". These packs are placed near the store check-out counters and include six different schemes with monthly premiums ranging from $2.5 to eight dollars with payouts between $700 to $1,500 in the case of a death that is provided as a lump sum to cover funeral costs. The purchase price of the starter pack is inclusive of the first month's premium. Within 72 hours of a purchase, the customer is called by an authorised insurance agent from Hollard who collects all required personal details and provides qualified advice. The customer has a 30 day cool-off period to withdraw from the policy. Follow-up monthly premium payments can be made in the nearby PEP store. PEP receives a 10 per cent commission per sale as well as a share of the generated insurance profit. Within three years of its inception, Hollard had created a customer base of over 600,000.